I wasn’t at all sure what to expect from Candide. I’d heard Voltaire’s name before, of course, though I knew very little about him or his works. In fact, it wasn’t until I found this book on my university reading list that I ventured to find out more. What I did immediately discover was that Candide is a satire. But would I find it funny? This is mid-eighteenth century French humour so how much would I understand? Well, as it happens, quite a lot – I found it hilarious! A lot of Candide is obviously silly and so, having a wacky sense of humour myself, I was often laughing out loud. It’s also fairly easy to identify some of the aspects which Voltaire has chosen to parody. Among these are societies, cultures, the adventure and romance genres, and philosophy. The context of the philosophical humour was a little lost on me at the time of reading, though I later found out that Voltaire's aim was to ridicule some of the more popular philosophies of his day. 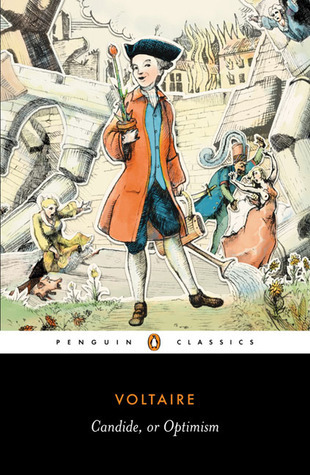 I’m looking forward to learning more about Candide when my next course rolls around – I have a feeling it’ll be very interesting to analyse. For now, though, I can only say that my enjoyment was a very pleasant discovery.